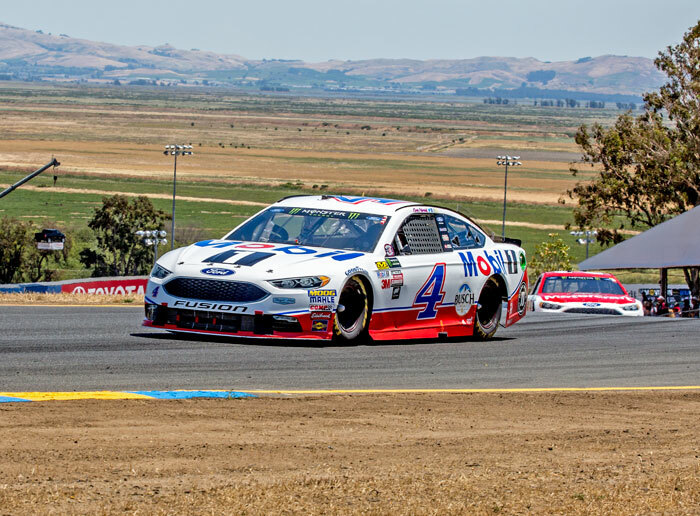 Kevin Harvick aka Happy Harvick, made it two for two in winning races this weekend, putting his No.4 Mobil 1 Ford in Victory Circle Sunday at Sonoma Raceway. 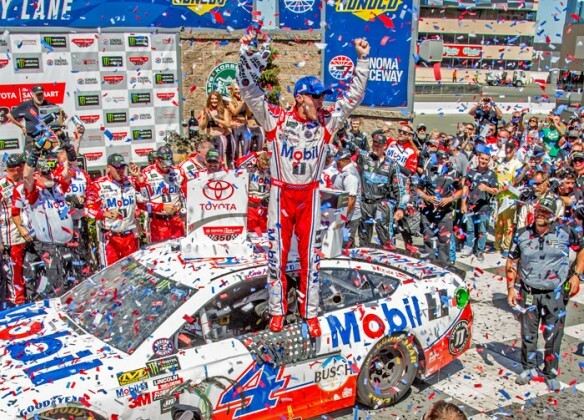 He won the 29th Annual Toyota/Save Mart 350 Monster Energy NASCAR Cup Series race. Harvick was the 11th winner in the 16 Cup races so far. 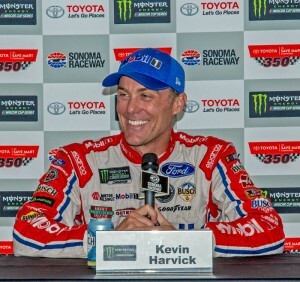 Harvick, the California Kid, had never won a Cup race at Sonoma, the Cup track he considers ‘home.’ His team owner, Tony Stewart, won the race last year. 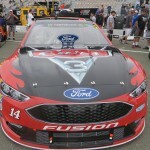 This year, the Stewart Haas, owned by Stewart and Gene Haas, team switched to Ford. “It’s been a lotta work, a lotta hours, and it’s paying off. 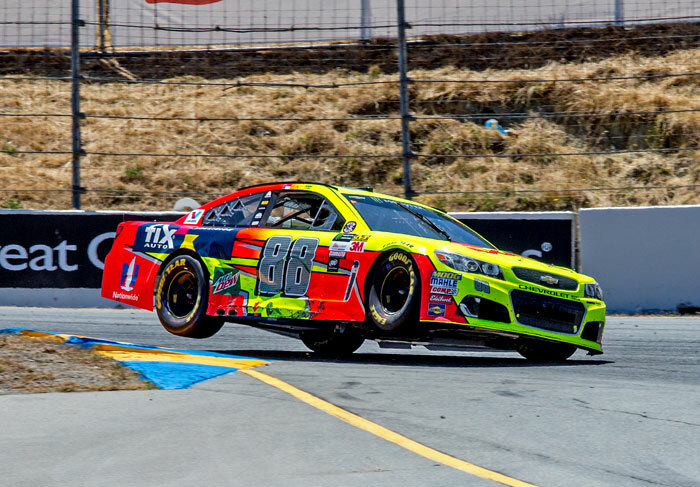 This is worth the wait, to come to Sonoma for so many years. This weekend has worked out well. 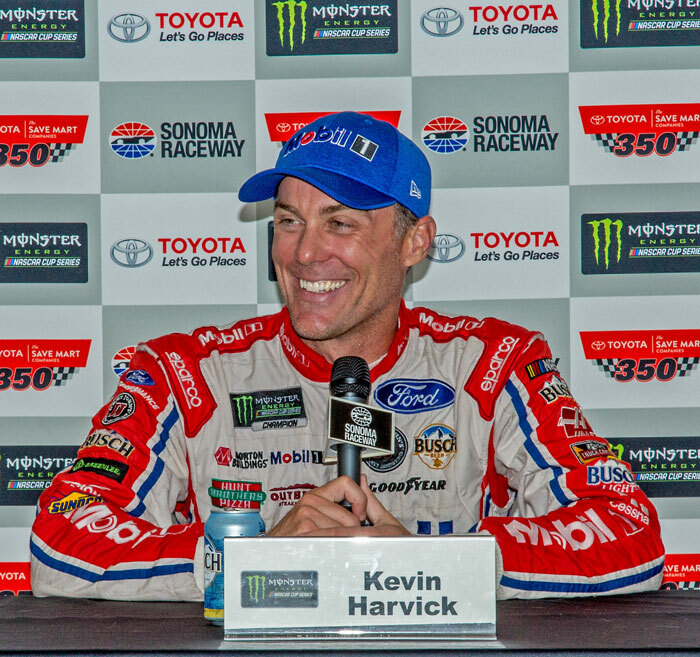 Harvick hadn’t won a race this year, so this was his first win of the season, his 36th career victory, and his first win since his team switched to Ford for this season. The team has won twice, the other victory belonging to Kurt Busch. Ford has won seven races this season. Harvick’s win brings him up to third in the Driver points. As race wore down, Harvick was slowing down to save fuel, but still maintaining a healthy lead ahead of contending SHR teammate,Clint Bowyer. Harvick led twice in the race, laps 65-66 and the last 21 laps. 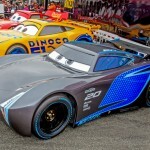 Bowyer had the CARS 3 racecar this weekend. 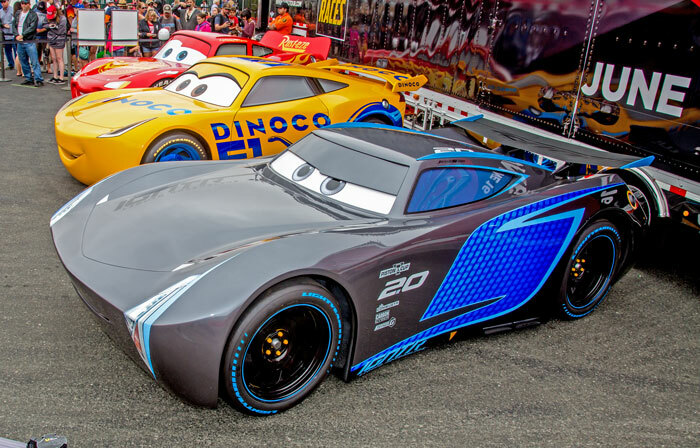 For those who need more encouragement to go see the movie just out, which features substantial voiceovers from the late Paul Newman as Doc Hudson, here is another photo of the Pixar CARS. Third through fifth were Brad Keselowski/No.2 Freightliner Elite Support Ford; Denny Hamlin/No.11 FedEx Ground Toyota; and Kyle Busch/No.18 M&M’s Caramel Toyota. Pole Sitter Kyle Larson/No.42 Target Chevrolet led for the first nine laps before being passed by Martin Truex, Jr/No.78 Furniture Row Toyota. He then ran off course and fell backwards. 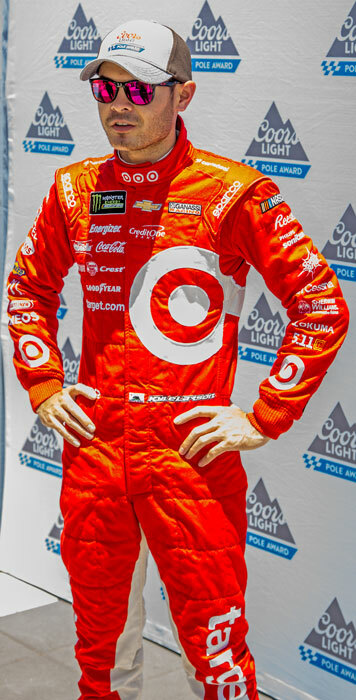 Larson won four different races in the past week, but was lapped in the fading moments of the Cup race. He finished twenty-sixth. However, Larson maintain his points lead, 659 points, thirteen ahead of Truex. Daniel Suarez/No.19 Stanley Toyota was the top Rookie, finishing sixteenth. 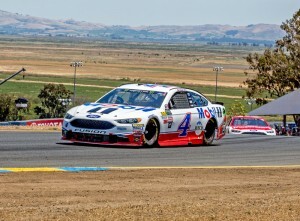 Harvick won Saturday’s Carneros 250 NASCAR K&N Pro Series-West race, and said then, and now, that he wanted to keep busy on weekends, wanted to get more laps on a road course, and definitely wanted to bring more attention to and work with the Western series to help them get more attention and sponsorship. 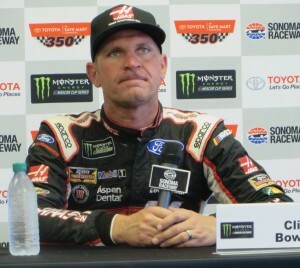 The Western drivers sometimes don’t get equal representation or focus as do the Eastern series, and Harvick wants to change that. 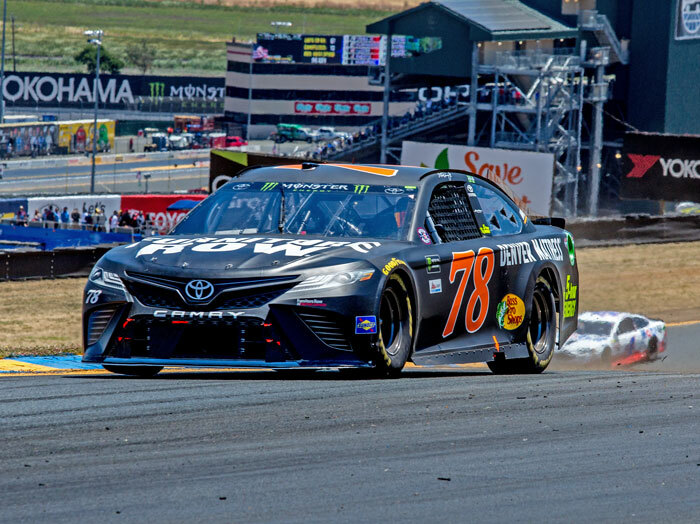 Martin Truex, Jr/No.78 Furniture Row Toyota won the first Stage, making it the eleventh stage he’s won this season, which helps him points wise. With two wins and 11 stages, he has 21 Playoff Points, more than any other Cup driver. His day didn’t end so well, however, as his engine failed and he retired on Lap 86. Jimmie Johnson/No48 Lowe’s Chevrolet won Stage Two, his first. He already has two victories, so he’s in the Playoffs. 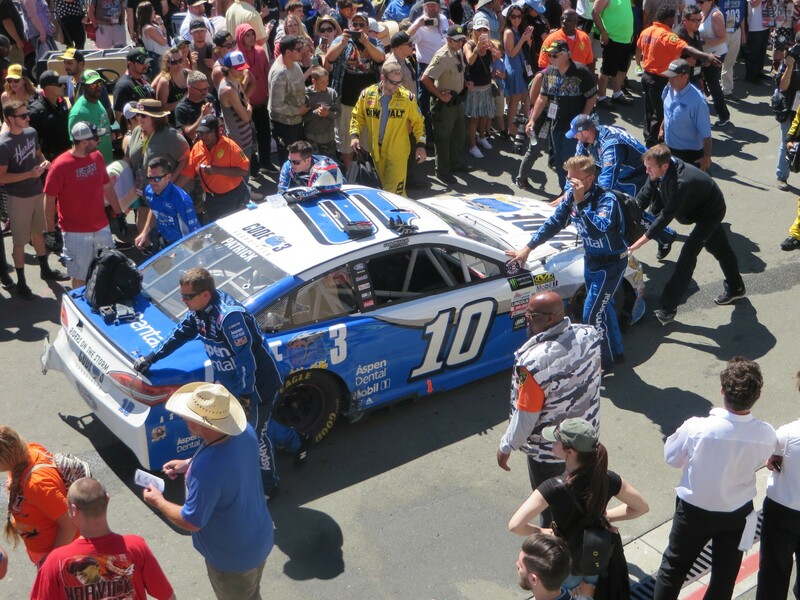 Danica Patrick/No.10 Code 3 Associates Ford had a character-building race. She had her best start this season, sixth. Patrick had contact with Earnhardt in the first stage, and finished thirty-seventh. That brought out a caution to rearrange the tire stacks. 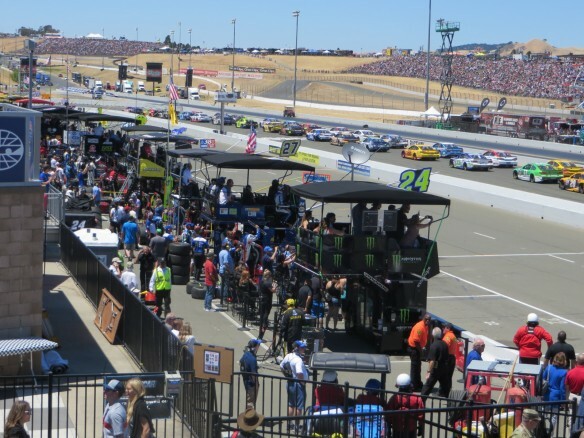 She started Stage Two from twentieth, and had another contact with Earnhardt which included AJ Allmendinger/No.47 Kroeger Chevrolet, which spun her wherein she was then hit by Ricky Stenhouse, Jr/No.17 Fastenal Ford. Patrick finished that stage in 34th. She started Stage Three from eighteenth spot and finished 17th, on the lead lap. “It definitely wasn’t the day the Code 3 Associates team was expecting, but we were able to battle back to a decent finish. 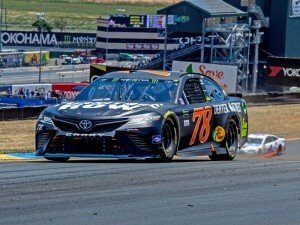 The car was just awful in the final laps of the last two runs, but we made the most of it at the end.” Her boyfriend, Stenhouse, was evaluated and released from the infield care center. As the race progressed, the average race speed increased to 77.710 mph, but never reached last year’s average of 80.966 mph. The three-stage race was interrupted by six cautions for 12 laps, but none for the third and final stage – 60 laps. There were several speeding tickets, including Trevor Bayne, Clint Bowyer, Kyle Busch, Dale Earnhardt, Jr, and Joey Logano. Other penalties included too many crew over wall or over wall too soon or not in contact with outside tire, and pitting before pit road open. 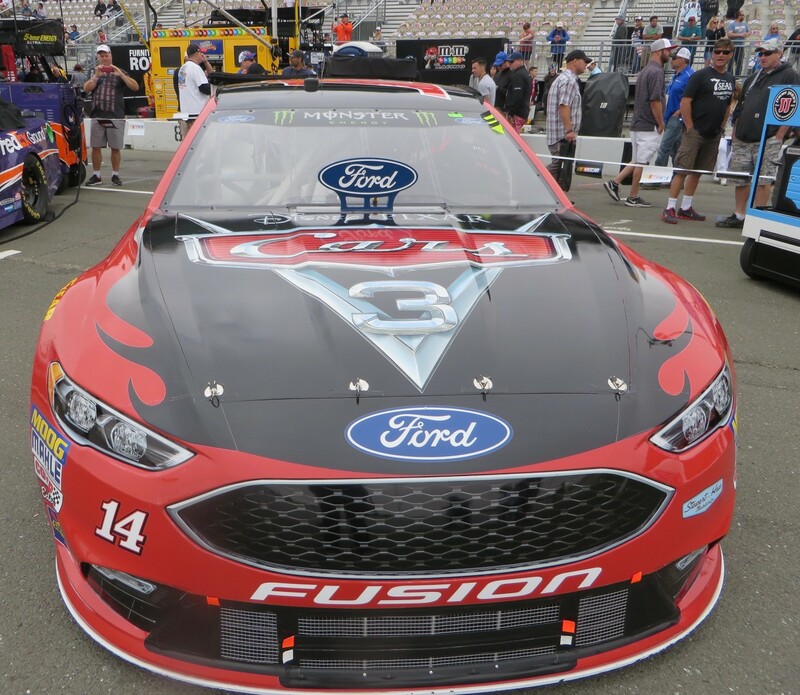 Post Race Tech Inspection Report: First and second place cars plus the random car, No.1 Chip Ganassi Racing Chevrolet passed the ‘At Track’ Inspection and left for the NASCAR R&D Facility in Charlotte. The third, fourth and fifth place finishing cars passed the ‘At Track’ Inspection and were released. NASCAR Tech had an issue with the No.18 Joe Gibbs Racing Toyota having two lug nuts not safe and secure. This means a one-race suspension for the Crew Chief and a $20,000 fine. The Kyle Busch team is already serving a Crew Chief suspension for having five lug nuts not safe and secure leaving the pits at Dover. That wheel left the car. 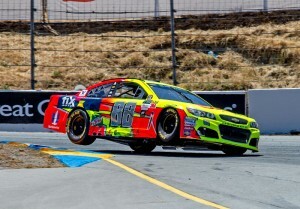 At Sonoma, the No.18 Assistant Crew Chief was filling in. Now the No.18 team will go to the next backup Crew Chief. The next race is 1 July 2017 at Daytona International Speedway. This entry was posted in Motor Sports, NASCAR by Lynne Huntting. Bookmark the permalink.